Can we talk about something for a second?! I had a losing my mind moment in the parking lot yesterday. I am a creature of habit. It’s the Type A blessing and/or curse, depending on how you look at it! We have a fairly structured routine around here. We go to the gym certain days of the week. We have OT appointment other days of the week. We go to the same church service every week…and we sit in the same place at said church service every week. No, really…I like routines, and habits. I don’t want to mess with other peoples! So yesterday I didn’t park in that row. I have no reason, I just didn’t. It was drizzling and I just wanted to get in the store as fast as possible, so I parked several rows over in a space that was close to the door. Now, this would have been a great plan…keeping us from getting too wet. Shoot. I parked on the other side. To try to stay dry. And now here we are, cruising up the wrong row, getting wet, wet, wet! So much for that plan!!! So yes, I got quite a few stares from other shoppers who were coming in and out of the store…as I made a huge U-turn with my big kid cart and headed 3 rows over to where I parked the car. I shall go back to my regular row…even if it means parking a little further away! So it’s a pantry challenge week…although my shopping trip doesn’t show for that! I was hoping to jsut spend $25-$30 this week…but then I opened the circular and saw that chicken breast and tilapia were both on sale for $1.99/lb. So those had to be added to the grocery list. Then I found some steaks in the Manager’s Special section…at prices that could not be passed up. Since I knew that I had $50 to spend this last week, I thought I’d splurge! I also splurged on some greek yogurt for my husband, as I found a blinkie coupon on the shelf sitting next to the containers. Another little splurge and treat for Steve! 2 packages of steak…both of which I marinated in a garlic onion seasoning and then put into the freezer. Will be perfect for grilling out this summer! Total for the month: $249.68 + $45.30 = $295 and change! I’m a creature of habit too: I park at the very back of a lot, furthest from the store in hopes no one will ding my car but also to add some steps to my day. If ever it’s raining & I choose a close spot, you’ll find me too with a dazed look on my face as I search for my lost car in the rain. I’m trying not to buy anything from the store these days, instead trying to use up the early produce (kale, asparagus, radishes) and whatever’s already on hand as an experiment to see how long I can go. wish me luck! 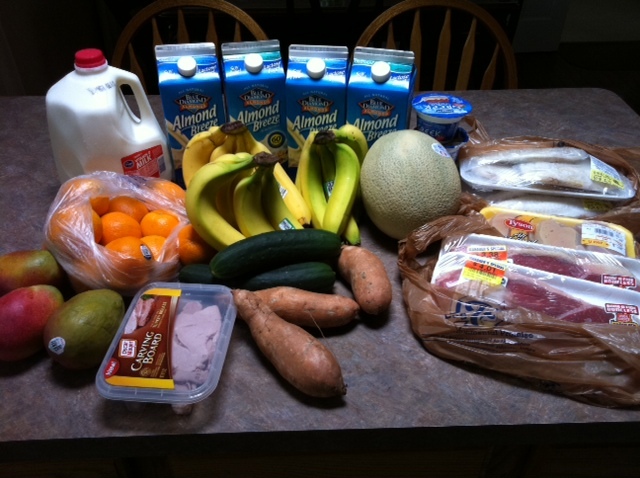 Are you noticing it more difficult to stay under the $300 with rising grocery prices? My budget for a family of four has been $300 per month, but the last 3 months we were at $350! I have accepted it and decided to raise my budget because I know I have seen an increase in grocery prices! Plus I have 2 hungry boys! Yes Kelly…it’s definitely getting harder. I bumped up from $60/week to $75/week a few months ago, but mostly because of the more expensive ingredients that I have to get for Tyler with his food sensitivities. I often don’t buy apple juice because I can’t squeeze it in, and have noticed it is more difficult. We planned our meals for the month using what we have on hand. My goal is to free up some $$ for some medical bills by spending less at the store!? (Like you we have specialists at Cincinnati Childrens). We are trying to use up our veggies stockpile from last summer/fall farmers markets stach, plus we just bought a 1/4 of a cow and have some fish on hand. We planted some spring veggies but I can’t imagine them being done in May (we’ll see). Chicken pick ups don’t start until 5/15 (we by only local chicken, eggs, and beef), so not many dishes with chicken until after that time. My question for you is, when you do a pantry challenge what are your “rules” as to what you buy at the store and your budget. My thoughts are fresh produce, almond milk (although I stocked up with last weeks Silk Almond milk sale b/c of the coupons I had), orange juice, and eggs. Any suggestions on the topic would be great! I always park in the same spot too. Last week, I left the store and started walking up the aisle and felt like I was losing my mind–I couldn’t find my car anywhere. Then I realized I had brought the truck instead . . . . Lucky for me there were no witnesses–the kids were all in school! As food prices keep increasing I think it is even more important to focus on staying within the family budget ( unless that much more money is coming in). For our family, we have simply been aware of what will or won’t fit into the budget ($150 for 2 adults). So far, so good. That being said, I have not had a fresh tomato in 2 months and we are eating more cauliflower and less steak but that is the purpose of having a spending limit. Of course, medical issues trump all but for most of us I think this is an opportunity to see how committed we really are to living within our means. Hope this doesn’t sound too” Polly Anna”. It is getting much harder to stay under that budget. I have a decent stockpile on dry goods/canned from last year but meat -ughhh. My buy price for chicken thighs alone has risen 20 cents a pound. As far as ur apple juice- do u not have a Schnucks around you? I think Albertsons is the same company. They often and now have the Old Orchard at 4/5.00 . Mine doubles up to 60 cents so the 50 cent q is the only reason we are able to have it all the time. I’ve been buying the frozen concentrate apple juice lately. I think it’s about a dollar at target. I add an extra can of water when I mix it and then only give my son about a 1/4 juice in his cup.